Last week I blogged about some poetry books that I like to read with my own kids, and with the schoolchildren that I spend time reading with each week. The other resource that I use every week at school and that my gang at home have loved are a series of short stories, two in each book which come in a series as ‘A Pair of Jacks’. There are four books in the series, written by Michael Lawrence and illustrated by Tony Ross. Each story is about 60 pages long, with large print and good pictures. What makes them great for readers all through Key Stage 2 (the Juniors to those of us who went to school before the National Curriculum) is that although there are not many words, there is much rich vocabulary and lots of fun with literary form in just a few pages. Fiction-averse boys have enjoyed these stories as much as the girls – they are clever and humourous. They often play around with classic stories – the first one in the book shown above is called ‘Jack and the Broomstick‘ and is a parody of Jack and the Beanstalk – great for more able kids to think about how the original story has been subverted, but simple enough for the less able to enjoy aswell. This week I was reading from Jack-in-the-Box with a few of the children and we were discussing the meaning of ‘console’, ‘magnanimous’ and ‘ingrate’ as well as the frequency of orphan stories in children’s literature. I’ve had another little spurt of book reviewing for our summer camp for Pathfinders (ages 11-14) as I’m trying to work out which books to order for the bookstall I’m going to be running. YP’s Guide to the Bible is a great little 32 page booklet, costing less than £3. It’s a reference guide for dipping into and includes flow charts, basic bible facts, bible help for young people, key people and topics, a time line, outlines of bible books and maps. 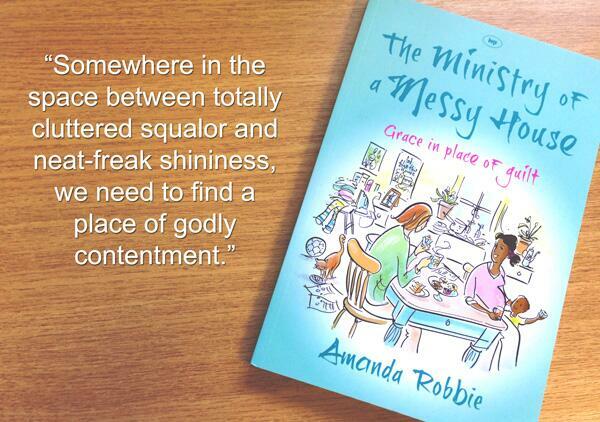 This guide would be great for every Christian (even grown-ups!) to have on their shelf and I’ll be pushing for every Pathfinder on our camp to take one home. It’s good value and an excellent little starter for anyone who wants to understand how the bible fits together, what it’s all about and why Christians read it. As the quote from Vaughan Roberts on p4 of the booklet reminds us ‘It is just one book written by one author with one main subject’. That main subject being Jesus Christ. I can start with 4 ingredients in the cupboard and have 2 trays of flapjacks ready and out of the oven in less than half an hour. This is a delicious flapjack recipe – my absolute favourite, with a chewy texture and a delicious caramel taste. It’s my go-to recipe for home-made treats in a hurry. I was originally given the recipe by another ordinand’s wife when the Vicar was training for ministry and I must have baked these flapjacks at least 100 times since then without a bad batch. I usually make a double batch as it only takes a couple of minutes more than a single batch and there never seems to be any trouble in disposing of them. Melt the sugar, margarine and golden syrup together in a large microwave bowl (or in a saucepan on the stove if you don’t have a microwave) – it takes about 2 minutes on full power in my cheapo 750W microwave. To get the golden syrup out of my measuring spoon easily I dip the spoon (a metal one) in a mug of just boiled water before adding each spoonful. Once the sugar, marg and syrup have melted together, mix in the oats. Then pop the mix in a 8″x12″ baking tin, lined with silicone baking paper (or a reusable liner like I use), and flatten it down so that it’s evenly distributed and pop it in the oven. Your oven needs to be pre-heated to 180ºC (Gas 4, Fan 170ºC). In my fan oven, the flapjack takes 15 minutes to cook, but can take 20-30mins if your oven isn’t as speedy or isn’t quite up to temperature at the beginning. 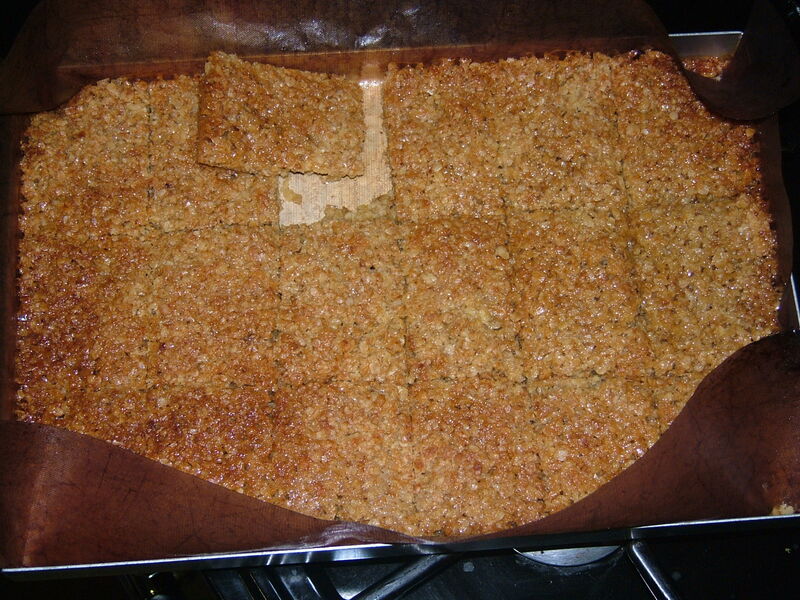 Once it’s golden on top, remove from the oven and leave in the tin for five minutes before cutting into slices sized to your flapjack appetite (generally 21-24 in my experience) and leaving to cool fully in the tin. If you cook it a little longer, it’ll be crunchy rather than chewy, so you can cook differently according to your flapjack preference. Last week I made the unhappy discovery that the Vicar is meant to write his marriage registers in indelible ink. It’s obvious when you think about it – you don’t want your marriage certificate to fade after a few years, but unfortunately we hadn’t thought about it and hadn’t had it pointed out either. This information wasn’t included in ordination training, nor in the diocesan training for curates (as far as the Vicar remembers, anyway). Thankfully (and rather sadly), in our sort of parish there aren’t many marriages at all and those that there are aren’t often in church, so not too many documents were filled out in evil biro before we discovered this. Apparently, ink should be to ISO 12757-2. You can get pens with this special international standard ink from Staedtler (who incidentally make the world’s best felttips, in Vicarage experience). Registrar’s ink does not fade from documents, nor from carpet, in the unhappy experience of one of my informants. Hopefully this blogpost will prevent the writing of a few registers in dodgy ink in the future. I suspect that as the number of church weddings continues to decrease, clergy will be less familiar with this requirement and fading ink registers may become more numerous. Now, I don’t want you all to think that I’m cynical, but at the end of last week I saw some laminated sheets tied to some railings just round the corner from us. 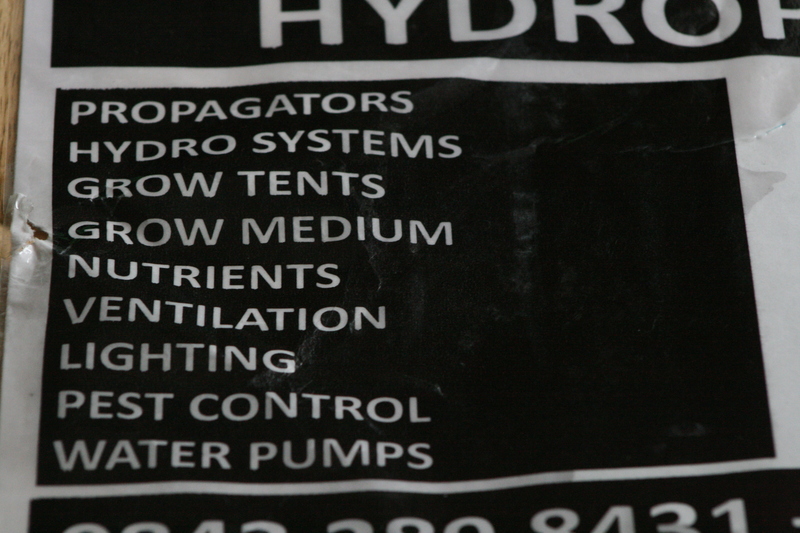 They were adverts for a local company who supply hydroponic equipment. Hydroponic systems are used for growing tomatoes, but also for growing cannabis plants. Obviously, it’s completely legal to sell hydroponic systems because they can be used by gardeners growing fruit, vegetables and flowers. But after last week’s tale of the cannabis factory raided locally, and very regular stories in our local rag on the same subject, I thought it a little unlikely that they were hoping to get the majority of their trade from allotment holders. Just to put the pinnacle on a super-busy week, the Vicar is off on a conference this afternoon. Only 24 hours, but it means I have some interesting travelling arrangements to make to ensure that the rest of us get home safely from the Boys Brigade awards evening, as I’m going to be carless. I’ve mentioned it a bit late for you to book up too, but the website has some helpful stuff on inner city ministry and I’m hoping talks will be available online at a later date. Despite the hassle, I’m glad the Vicar is going – it’s a conference he needs to be at (and I rather wish I was too), especially after the experiences of the last couple of weeks. A granny was robbed of gold necklace after she collected her grandchild from our school nursery. Lunchtime yesterday. A friend’s business was burgled a few days ago. When police came round to look at the break-in they smelt something suspicious. They raided the unit next door and found a cannabis factory. 2 men (dad and an uncle?) were taking a young lad, maybe six years old, to the ice-cream van, just as school was out and streams of kids were passing and queuing. They were dressed in t-shirts bearing what I have found are sometimes called ‘comedy‘ phrases. I wasn’t very amused myself. I don’t shop at Blue Inc, or I’d be boycotting their business. A kid who thought that ‘the taxpayer’ would pay for our broken windows, so it wasn’t such a big issue after all. And these are just the stories that I can tell in public. The evil and brokenness around us here can sometimes be heartbreaking. Despite that, we are encouraged regularly. This week some kind builders have been supplying us with wooden pallets (for burning and for storing logs on) and some tree surgeons gave us a tree that they’d been chopping down. Vicarage warmth is assured for next winter. Like every week at the Vicarage, it’s been a fair old mix, but perhaps more of a mix than most people enjoy. It makes me remember that old hymn and resolve to employ my heart and tongue as I should.